Okay, so Andre Rieu’s not usually the kind of fodder that you’d find here on the pages of auspOp, but when the violin playing supremo that oldies just can’t get enough is in the country at the moment and he’s breaking these kinds of records, we feel that we have to report. Staggeringly, Andre has just notched up $50 million dollars worth of wholesale shipments of his CDs and DVDs in Australia. 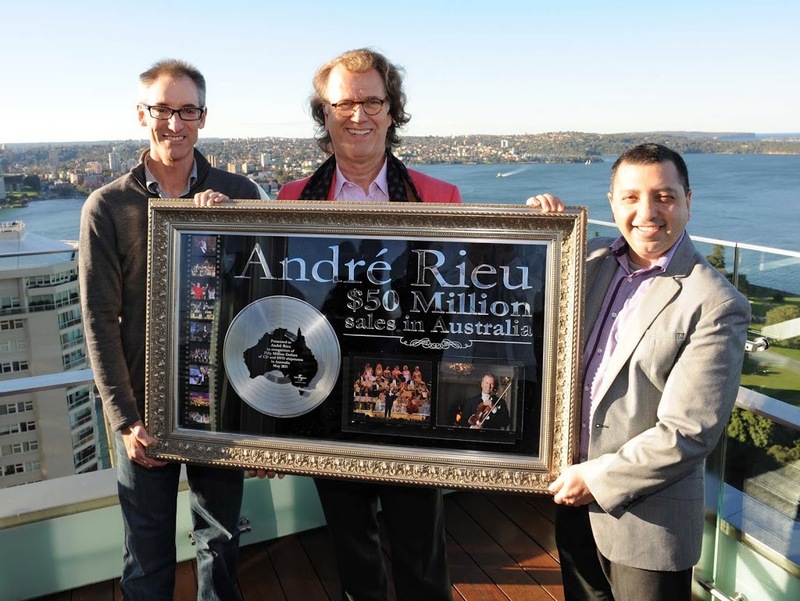 Andre has become the highest selling music artist in the Australian market throughout the past five years and the President of Universal Music Australia, George Ash (pictured on the left), was on hand to present Andre with an award commemorating his incredible sales. Andre has so far clocked up more than three million sales in the Australian market alone. His next DVD ‘Fiesta Mexicana!’, released later this month, will only add to that tally. Pictured with George Ash (left) and Andre (centre) is Cyrus Meher-Homji, the Director of Marketing and A&R, Classics & Jazz, Universal Music Australia.